The Witch's Island: Christmas is just WAY too busy! Christmas is just WAY too busy! I hate feeling guilty about not posting. I know that if I want to keep my readers happy I have to say something interesting on a reasonably frequent basis but this week I think that I might have dropped the ball, or at least fumbled it a bit. My, oh my, we have been busy and I'm just now finding the time to sit down here for a few minutes to write this. Guilt be damned! The training that I have been doing for my new position has been accelerating every week since I started it. At first I was told that I would apprentice for a year or more, maybe a year and a half, but on Friday I was told that both my trainer and my supervisor think that I have progressed far beyond expectation. They think that I am ready to receive almost full qualification. It makes me very anxious, more than a little nervous, to accept full responsibility for my work. Don't they realize that I have only really had about three months of training? I appreciate the vote of confidence they have given to me but surely there must be a heck of alot more to learn. Hubby is extremely proud of what I have achieved but I am just worried that someone is going to notice that the Emperor isn't wearing any clothes. I hope that I'm not going to let everyone down. Combine orange juice, orange peel and raisins; let stand overnight. Beat butter and sugar until fluffy. Beat in egg. Combine flour and baking soda; stir into butter mixture. Add raisins, any soaking liquid and oats; mix well. Drop dough by rounded teaspoonfuls onto greased or parchment-lined baking sheets, spacing 2 inches apart; flatten slightly. Bake at 350 degrees F for 10 to 12 minutes. Cool completely. In the upper pot of a double boiler, over medium heat, warm the chocolate until melted. Stir until smooth. Dip one edge of each cookie into chocolate and gently shake off excess back into the pot. 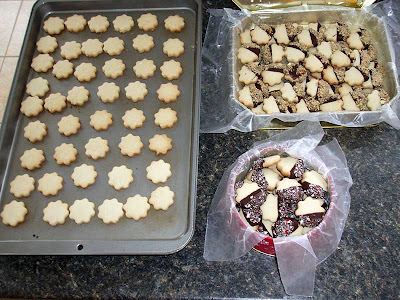 Place dipped cookies onto wax paper lined cookie sheet and allow 15 minutes to set completely. Chill or freeze. Doesn't matter, they won't last long anyway. I'm really glad things are going so well at work!!! Has it been 3 months already that you started the training? Wow, time flies! 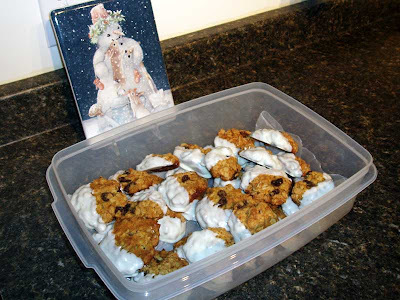 Those cookies are making my mouth water.... YUM! Your recipients are very lucky! congrats on our progress with your job. Never feel guilty about not posting, there are more important things in life. When you can post we'll all still be here to read them.